Amongst young people social media has been consistently growing in popularity over the past ten years. EU Kids Online’s research on young people’s use of digital media across 25 European countries suggests that from 2005 to 2010 internet use increased from 70 to 93 per cent amongst 6- to 17-year-olds. 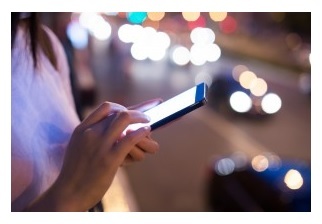 Research conducted by Ofcom in 2011 reveals that young people are visiting social network sites more often on their mobiles – reflecting an increase in ‘smart phone’ ownership. As of mid-2016 in the UK there are approximately 2.5 million 13- to 17-year-olds using Facebook and over 2 million young people under the age of 18 using Snapchat. Social media has afforded young people the opportunity to interact with friends and to access information in ways previous generations of young people would not have thought possible. Alongside the benefits of social media, there are dangers. Young people’s ability to post detailed information about themselves online – which can potentially be accessed by any website or app visitor – has raised concerns about the risks (e.g. sexting). In some cases social media communication has led to abuse of personal information (e.g. catfishing, cyberbullying). Moreover, international research and national research suggests that cyberbullying is an increasing trend amongst young people across the globe with one in five young people between 13 to 18 years old reporting experiences of online abuse. A global online YouGov survey of 4,700 teenagers found that one fifth of teenagers who had experienced cyberbullying contemplated suicide. Closer to home, Facebook, Ask.fm and Twitter were found to be the most likely sources of cyberbullying in the UK with 54% of people who used Facebook reporting cyberbullying. The incidence of cyberbullying is naturally a growing concern for educators. In addition to the physical bullying that sometimes occurs in schools, it may be that children are under stress from cyberbullying which is difficult for teachers to detect, prevent and manage as social media outlets are often outside their control. Which social networking websites do you use the most? How many days in a typical week are you bullied when using a website? How many days in a typical week are you bullied when using an app? We surveyed 351, 380 and 324 pupils in years 7, 9 and 11 respectively. Amongst all groups, Facebook was the most popular social network, with Twitter and Instagram coming in a distant second and third place. Predictably, students seem to use apps more than websites reflecting the growing role of mobile phones in young peoples’ lives. However due to the fast-paced nature of social media, our data may be already outdated, as indicated by the claim that young people only use two types of social media: Snapchat and Instagram. 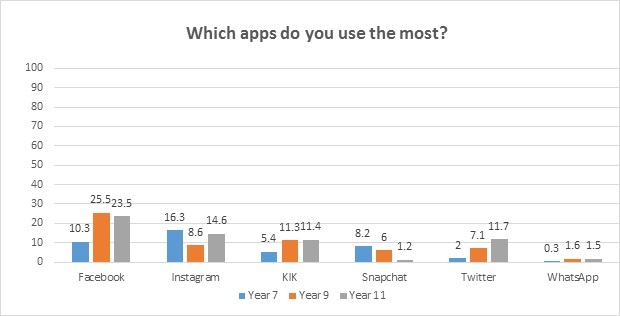 This assertion was supported in our findings with year 7 students who identified image sharing apps (Instagram and Snapchat) as their most used social media. When asked about cyberbullying, pupils generally indicated that they had not experienced this, with 59 to 88 per cent of year 7, 9 and 11 pupils reporting that they had not experienced bullying while using websites. Additionally, 59 to 82 per cent of year 7, 9 and 11 pupils reported that they did not experience bullying while using apps. Looking at the combined 7.1 per cent of all year 7, 9 and 11 pupils surveyed who identified being bullied while using a website compared to 7.4 per cent of all pupils who identified being bullied while using an app. Our data reaffirms Ofcom’s finding that young people are visiting social network sites more often on their mobiles than on websites. Researching the incidence of cyberbullying in young people can be very challenging. The way survey questions are asked plays a vital role in what data is collected and can reveal different patterns. For example, when compared with YouGov’s survey on young people’s cyberbullying rates, the evidence from our surveys with year 7, 9 and 11 pupils suggests that cyberbullying may occur less frequently in Wales than in the rest of the UK. However, the degree of non-repsonse to some of our questions may also hide actual levels of bullying. Our survey asked pupils how often they were cyberbullied whereas, YouGov’s survey asked pupils ‘Have you EVER been cyberbullied?’ Their survey did not delve into how frequently cyberbullying occurred amongst young people. Had our research team asked the same question perhaps our figures would have been higher. There is a clear need for further research on this new phenomenon. However, whilst our numbers of cyberbullying are relatively low, the risk of cyberbullying to young people should not be dismissed. Across our data, four students reported being bullied on a daily basis on apps and/or websites. We can not be complacent about this risk. If even one child is being bullied it is one child too many. The WISERD research mentioned in this article benefited from funding from the Higher Education Council Funding for Wales (HEFCW) Partners.